Restore your carpets and rugs to their original colors and texture. Whether you have an antique silk floor covering or a modern wall-to-wall carpet, we have the equipment and the experience to clean it thoroughly and gently. Take advantage of our emergency cleaning services to get rid of accidental spills in a timely manner and even include this service as part of your regular house cleaning schedule. Our top carpet cleaners are reference-checked, fully trained, experienced and have the knowledge how to work with modern equipment and professional cleaning products. When it comes to carpet and rug cleaning, it’s the combination of both skills and technology that make a real difference in the results you can expect. Hot water extraction: Also known as steam cleaning. Used generally for non-shrinkable materials. Most effective against heavy staining. It can take up to three hours for your carpet to completely dry. Open a door or a window to speed up the process. Dry powder cleaning: Used mostly for textiles that can be damaged by excessive water or when you need faster drying times. Great for surface cleaning. Can’t provide the same level of deep fabric treatment. No matter how cautious you are with your soft furniture, it’s inevitable for dirt to build-up over time. Especially when you have kids and pets, the chances are the buildup will happen sooner than later. When you want to preserve and protect your upholstered furniture for years to come, call (404) 596-6083 for help. Achieve great results in less time! 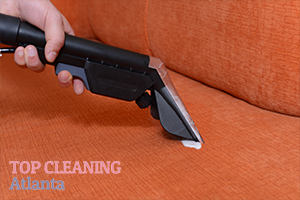 Our cleaners will utilize modern methods and solutions to ensure your sofas and armchairs are ready for use just after the cleaning process is finished. See and feel the difference right away.